SmokingPit.com -Hickory & maple Smoked lasagna - Slow cooked on a Treager Pellet grill. This is a fun cook! And a pretty tasty one if I might add. You will use Prego or any quality store bought sauce but it will be amazing! I plan on doing this again but with a gourmet sauce as son as I come up with the perfect one. Mix 1 lbs. ground beef and 1 lbs. maple sausage, 2 cloves garlic and Dried tomato & garlic pesto mix to taste in a bowl. Spread meat mix 3/4 " thick in a aluminum cooking tin. 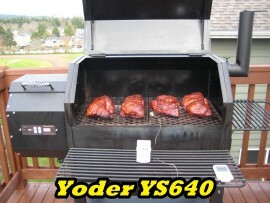 Place in smoker at 180 degrees for a couple hours chopping and stirring occasionally. Don't over cook, you just want to brown the meat and get in some smoke. Put 2 cloves of chopped garlic on the smoker. Mix browned meat mix with 2 bottles of Prego spaghetti sauce of your choice. Stir in 2 Tbsp brown sugar. 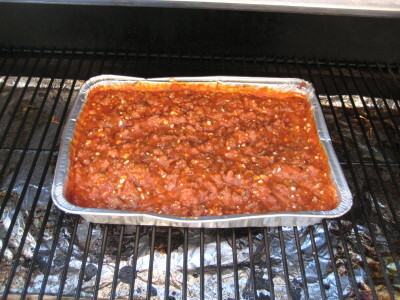 Place meat sauce in the smoker and simmer at 270 degrees for 45 minutes (total time). 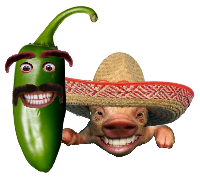 This well allow the flavors to meld. After 15 minutes stir in the chopped garlic from the smoker. Boil about 12 Lasagna noodles for approximately 20 minutes or until done. Rinse noodles under cold water until cooled. Lay noodles out on wax paper and pat dry with a paper tower. Noodles should be a bit sticky to the touch not slippery. Spread Ricotta cheese on noodles. 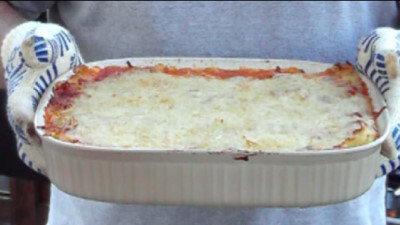 Grease a casserole dish and spoon in a thin layer of sauce. 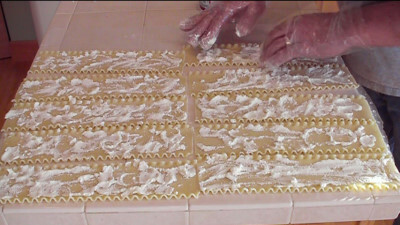 Lay Lasagna noodles in side by side covering the entire bottom. Spoon in a liberal amount of meat sauce and cover with Mozzarella cheese. Repeat for the next layer. 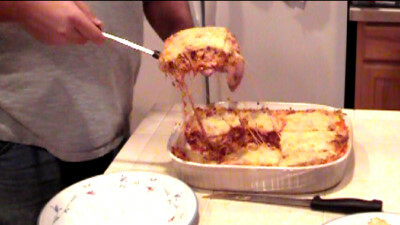 Then top with Lasagna noodles and a thin layer of sauce. Cover in Mozzarella cheese and then sprinkle on some shredded Parmesan cheese to taste. Place Lasagna in smoker and bring the heat up to 375 degrees. 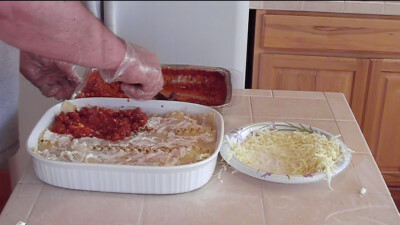 Cook for approximately 45 minutes to an hour or until the cheese is melted and the lasagna is bubbling on the sides. Toss a garlic bread into the smoker and remove the lasagna. Let stand for about 20 minutes then retrieve the garlic bread and get your grub on!